A recent communication from George for all of those who wonder how he is doing in retirement. George has kept active academically by serving on several dissertation committees and attending an occasional Tuesday meeting. In June, 2010, I was invited to work with Chinese and Western educators involved in developing a series of international schools in the Shanghai area. Under the theme, “East meets West” the relatively new primary and secondary schools utilize both Chinese and Western educational systems and fuse them into an integrated model. The schools promote bilingual education in Mandarin and English within an educational philosophy designed to develop students as life long global learners. The schools are administered by co-principals – one Chinese and one Westerner. Each classroom has a bilingual teaching team composed of one Chinese and one Westerner fluent in English. The infrastructure is provided by the Chinese system with an emphasis on Chinese Culture and math. Simultaneously students follow the British International General Certificate of Education at the primary level and the International Baccalaureate Program at the secondary level. Most students are Chinese, but over 30 nationalities are represented. These schools are viewed as a new, bold venture and the integrated system was selected as a Shanghai Educational Research Project. As part of the Project, I was brought over to address developments in international and global education in the U.S. as was an educator from the Netherlands Ministry of Education, who discussed the European Union’s approach to international education. 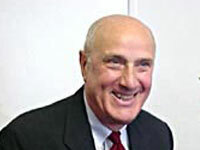 George E. Urch is Professor Emeritus in the Center for International Education. He continues to maintain a professional interest in internationalizing U.S. education through Global Education, and in education on the African continent. He has taught, consulted and directed educational development projects in over a dozen African countries. His interests include both formal and nonformal education. George continues to work with graduate students in the Center. Among his publications are: Education in Sub-Saharan Africa: A Source Book (Garland Press); "Nonformal Education and Rural Development in Ghana" in International Journal of Educational Development; "Kenya: The Emergence of an Educated Elite: in Praeger; "Education in Tanzania: A New Direction?" in African Journal, Vol.XVI; and "Global Education: The Time is Now" in Educational Horizons.